This letter was written by Pvt. Alfred Alverson Thayer (1838-1878) of Company C, 96th Ohio Infantry. 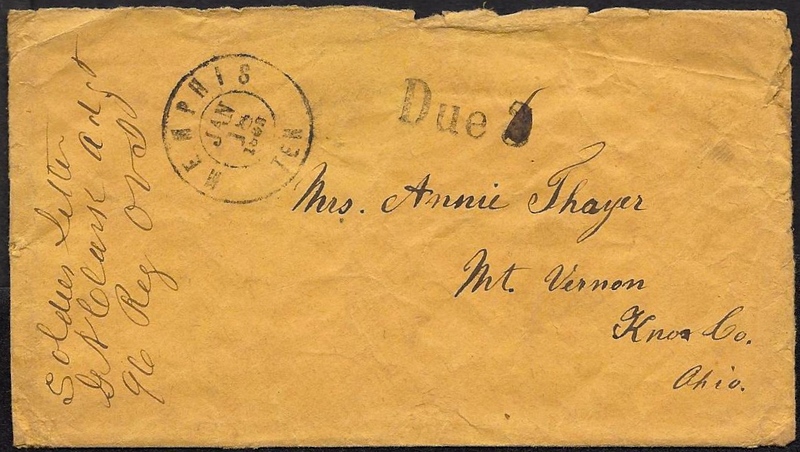 Alfred enlisted in August 1862 in Company B but was transferred to Company C in November 1864. The regimental record says that Alfred was present for duty in the battles of Chickasaw Bayou, Arkansas Post, Vicksburg, and Jackson. He became sick and was sent to a hospital at Memphis in August 1863 and returned to his company in December 1863. In March 1864, he became sick again and was sent to a hospital in New Orleans and returned to his company in September 1864. He was present for duty at Spanish Fort, Fort Blakely, Mobile and Whistler. He was mustered out of the service in July 1865 at Mobile, Alabama. Alfred was the son of Elias Parkman Thayer (1802-1873) and Lydia May Stinson (1804-1878). He was married to Anna Spearman (1842-1913) in 1864 (or earlier). In this letter, Alfred provides his wife some details of his New Year’s dinner. 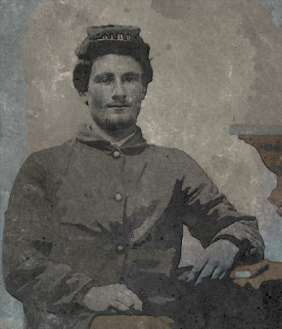 Alfred’s older brother, Isaiah Jackson Thayer (1833-1862) also served in Company B, 96th Ohio Infantry but died 2 September 1862 at Milliken’s Bend, Louisiana. He is buried at Vicksburg. Isaiah was married to Hannah Crowell (1836-1864) and left three children — Elias, Ann, and Ida. Elias died in September 1864 and tragically, Hanna also died in November 1864. It is with the great[est] pleasure that I have this opportunity to write to you to let you know that I am well excepting the earache — but not bad — & I hope these few lines may find you enjoying the same blessing of God. I haven’t received only 2 letters from you since we got here & we have been here three weeks tomorrow so it seems like as if I wasn’t going to get anymore for I want to hear from Perry so bad. I was on picket last Sunday. It was a very nice day but in the evening it clouded up & about 10 at night it began to rain. Just poured down. We were stationed in the woods in our squads — Harry [Harvey B.] Snediker, George [W.] Tish, two of the Roops [?] boys, Jack & myself — so there was a chicken coop close by & we broke for it and crept in & peeked out of the cracks & kept dry. In the morning, [it] still rained so we cooked breakfast in the coop too & the new pickets came. Then we broke for camp & it rained until noon. Our tent was all water & mud [but that did not scare us for we had seen that before. I always like to go on picket for we always have a good time. I hardly know what to write that will be beneficial to you, only that man that shot his fingers off is going to get a discharge but it will be a dishonorable one because it is believed that he done it a purpose. I would die in the army than to get a dishonorable discharge. The paper’s news is good here. Jeff Davis says if it ain’t settled by the first of next month, that they are gone in for the season. He picked out the smartest man he could & sent him to London to make a compromise for peace & offered to come back in the Union as before & each side pay their own debt. I don’t know any further about it. There is another grand review today. It makes the boys mad to hear anything about a review. It is pretty hard to put on the knapsack & march a whole half a day to see some Colonel stand to look at us as we pass by him. It was reported that the rebels had taken a brigade of our men but it ain’t so. Our men took a brigade of their men & have them here on the boat now & the boat is tied to the gun boat & it is an iron clad one. These iron clad look pretty savage seeing the old cannon sticking out all around. __ Brock is well & sends his love to all. He received his mother’s likeness. Ever dear wife, it has been four days since I commenced this letter & I thought I would finish. I was waiting to hear from you & I received a letter from you yesterday — the one that you & mother wrote on stating that William Spearman was sick away from home because I know that it will worry mother so bad but we must put our trust in the Lord & it will be alright in the end I hope. I also received a letter from Mary & Wash stating they were well. It does me so much good to get a letter from home. 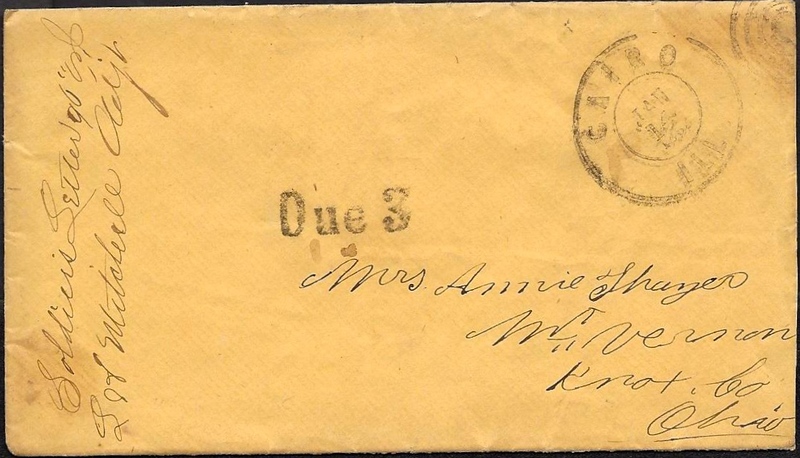 Annie Jack says that if you have any money to spare, if you will let Hannah have some, he will pay you when he gets his pay & there is some talk of getting our pay pretty soon now. But it is hard to tell. Give my love to father and mother Spearman & all inquiring friends & reserve a share for yourself. Direct to the 96 Regiment, Company B in care of Captain [Joseph] Leonard, OVI. Put on “Follow the Regiment” because it is hard to tell where we will be in a week from now. The dearest to me in this world, may the Lord bless you & keep you safe till we meet again is my prayer. So good bye for this time. It is with the greatest pleasure that I have this time to write you a few lines to let you know that I am well at present & hope these few lines may find you the same. I hope that you have got better of the rheumatism before this time. We have been running around on the river for a week. And they say tomorrow we are going up the river but I don’t know where. There is some batteries to take [and] the gunboats have gone up to see tonight & we expect to go in the morning. We have been working all day to chop & carry wood on the boat but we did not work very hard. We are pretty lazy. Annie, you must keep up your spirits for I enjoy myself the best I can. I run around on the boat all the time. There is a good many sick just by laying around. They have the diarrhea & measles. I think that the war is winding up as fast as it can. I think that I will be home again next spring if I live & I put my trust in the Lord for that. I know that I have the prayers of some friends at home too. 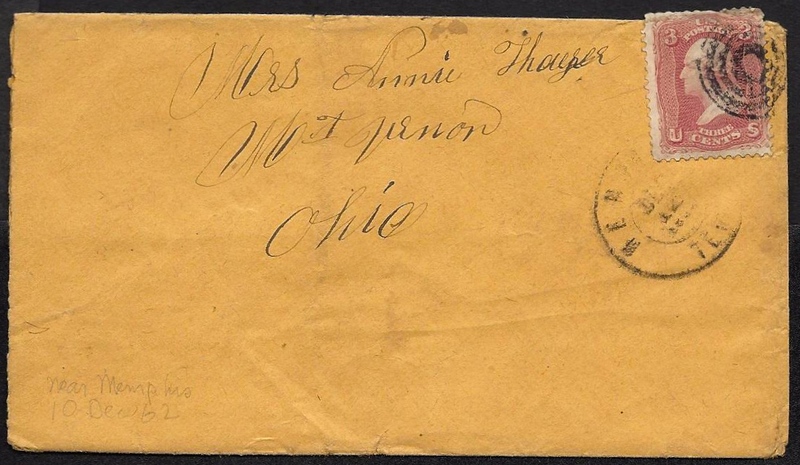 Annie, tell Perry that I got that letter that he sent in with Hannah & was very sorry to hear that he was so bad. I would give the world to see him but I can’t now. If we never meet again on earth, I hope that we may meet in a better world where fighting will be no more. Put your trust in the Lord & he will do all for the best. You must not think hard of me for not writing oftener for we are rung around so much but we get to see a great deal. Ever dear brother, keep in good spirits as you can. I was so glad to get a letter from you. We both send our love to you & we think of you very often. Every dear parents, you must not worry about us for we get along pretty well. I never have been sick a day yet. Jack has had the diarrhea but is better & we think we will get home to eat some of them molasses of yours. We are getting tired of riding on the boat. Write soon. Our love to all. I was very sorry to hear that Jane Pickerd had been so sick & William, I was glad to hear that he had got home. Bill isn’t very well at present. He has the diarrhea. He sends his love to you all. Tell Emma & Annie I am very sorry that they can’t get time to write a letter. Direct to the regiment, 96th [Ohio], Co. B, in care of Captain Leonard, OVI, to follow the regiment. To Mrs. Annie Thayer, the dearest to me in this world. Take care of yourself. I will write the particulars when I have more time. May the Lord bless you is my prayer. write soon. No more at present. So good bye. My love to all. It is with pleasure that I take my pen in hand this morning to answer your kind & welcome letter of the 27th. It found me well & hearty & was very glad to hear that you was so well & fat, but very sorry to hear that mother & Emma was so sick. I hadn’t heard of Emma being sick before & you said she was pretty sick but didn’t say where she was or how long she had been sick but I think by the way the letter read you must of written about her before but this is all I got. I was on picket when the mail came but my partner brought it out to me & there was a candy heart but it was broken so when I came in, Bill came over so I gave him a piece & my partner & a piece myself, so we dispose of it. I was very glad you had such a good dinner for I had a pleaded dinner but you know what I had before this time [on] New Years for Dan wanted me to eat with him but I went over to help Billy get dinner & just about the time we got dinner ready, he was taken with a chill & went to bed so I call them to dinner & waited on them. We had a god dinner & a splendid turkey. I would get along pretty well but there is one woman in the mess & I am afeared of women but we got through very well. Then I had to stay & eat & see to things. I done up the dishes, then went over & eat a little with Dan. He had a very nice dinner. By that time, it was near supper & the adjutant was hunting for me to get supper & wash up the dishes & Billy didn’t get up till after dark. 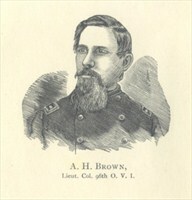 The adjutant [Louis H. Mitchell] said he didn’t know how they would get along if it hadn’t been for me & the Colonel [Albert H. Brown] told Billy to have me there whenever he wanted & to tell me to eat there whenever I wanted to. But he has been alright since. He hasn’t had any more [chills]. You said you wish I had some of your sausage to eat with my hard tack. They would be very good but not much hard tack I eat for old Dan always has a loaf for me when hard tacks come. My partner & me has 4 pounds of bread on hand now & will get 2 more in the morning & about 6 days of crackers on the shelf but the rest haven’t got so much. They ran out & we give. They can’t tell how we get ahead so Dan sends out pie & cake to me when I am on picket. I was very glad that Bill Spearman had quit for when he gets good wage. Annie, you be careful with yourself as you cannot expose yourself more than you can help. I am in hopes before you get this letter that mother & Emma will be well. Annie, we haven’t had very cold weather yet. It has froze enough to hold up a wagon but my gloves is alright. The old …. there will be lots more like him when we get out of the service. The health of the boys is very good & I expect we will stay here all winter. I hope so, We have it hard part of the time when there is no other regiment here. But the 161st New York is here. They picket three days to us one but they are under marching orders now. My love to all. Good bye. Bill & Dan are well & send their love to all. This entry was posted on Thursday, August 14th, 2014 at 3:09 pm	and posted in Uncategorized. You can follow any responses to this entry through the RSS 2.0 feed.